My daughter has recently bought herself a pair of Vibram FiveFinger running shoes. For those of you who might not be familiar with this latest cool product, I add here a picture of my daughter’s pair. I was not aware of the existence of these shoes until my daughter announced their purchase to me and my wife. 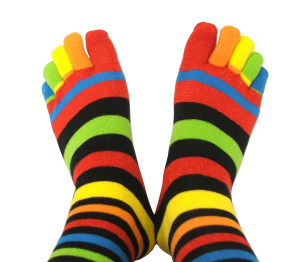 In our university days, back in the 1970s, we had come across the-then cool new product, socks with toes, when the sister of one our roommates came to visit and turned up at breakfast time sporting them. For those of my readers who are in the Stone Age of coolness and have never even seen this product, I append a picture. “Industrial Designer, Robert Fliri, first proposed the idea of FiveFingers footwear to Marco Bramani, grandson of Vibram founder Vitale Bramani, who immediately embraced the concept. Bramani and Fliri developed the first barefoot shoes, then showed the concept to Vibram USA president & CEO, Tony Post. As a former collegiate runner, Post quickly became a firm believer in the benefits of natural running* and fitness training. He discovered that Vibram FiveFingers were the unique solution to the knee pain and soreness he was experiencing when running. Soon, they collaborated with the full Vibram team to position Vibram FiveFingers® as a performance product for running, fitness and outdoor sports. FiveFingers not only encouraged a more natural forefoot strike during running, but also allowed the foot to move and work in a completely natural way, while providing grip and protection over a variety of surfaces. Yet, in all this wash of coolness and delight, I have to tell you that I find these shoes rather creepy, because they remind me of Saint Bartholomew. For those of my readers who are not well versed in Catholic martyrology, Saint Bartholomew, mentioned as one of the Twelve Apostles in the three Synoptic gospels and in the Acts of the Apostles, is reputed to have been martyred in Armenia by being flayed alive and crucified upside down. Since flaying is not a common practice any more, I should further elucidate that flaying is the act of stripping the skin off a person, preferably when still alive so as to make the experience of dying all that much more excruciatingly painful. 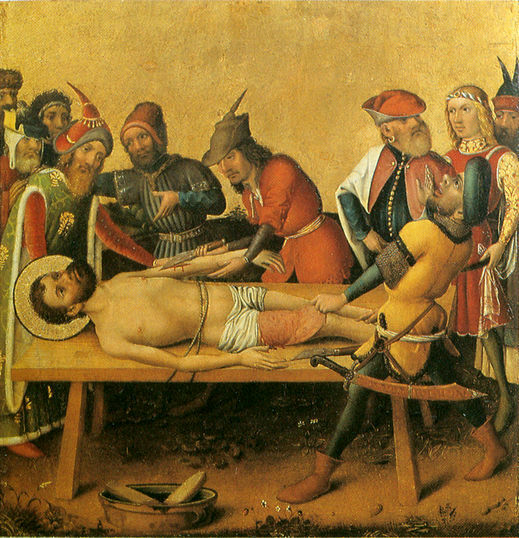 As anyone who has ever walked through the European medieval section of a good art museum will know, Medieval painters – no doubt responding to popular demand – took a morbid delight in showing in clinical detail the varied torments to which the Christian martyrs were subjected; given Saint Bartholomew’s particularly grisly end, he was a popular subject of such paintings. I show here such an example. Please note the stoicism with which Saint Bartholomew is taking it all. Personally, I would have been screaming and begging and pleading and blubbering and generally carrying on. But then I am not a Christian martyr. 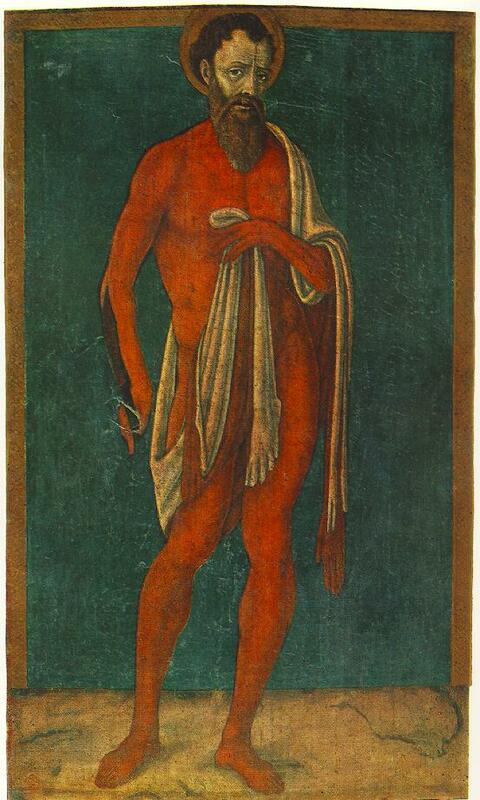 Usually, representations of Saint Bartholomew will show the poor man, stoic to the last, carrying his flayed skin as well as one of the knives used to flay him. This particular representation I find quite realistic since the – hopefully – corpse at the end of a flaying presumably must be a bloody mess, although in this particular painting the bloodiness looks more like a body stocking. Indeed, as time passed the gory details tended to be dropped in favour of a more romantic representation, such as this one in St. John Lateran in Rome. I am particularly mystified by the fact that the Saint has recovered his skin in this representation, but presumably when one goes to heaven one becomes whole again. 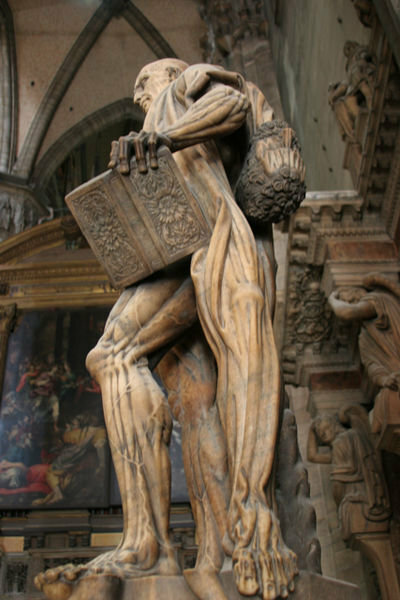 This trend towards the sucrose was spectacularly bucked by one Marco d’Agrate, who in 1562 created a gruesomely realistic statue of Saint Bartholomew which now resides in the Duomo of Milan. I happen to know the Duomo well since my wife is Milanese and as a patriotic duty we always visit the Duomo every time we go back. 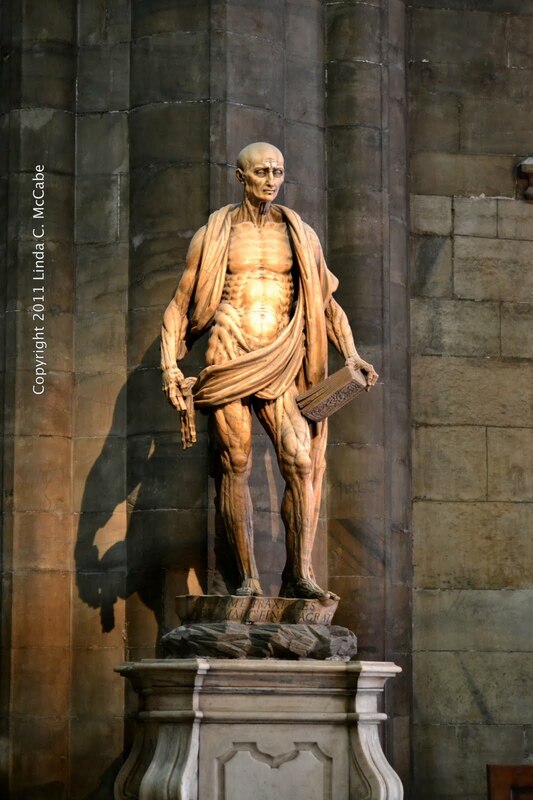 As this photo shows, Signor d’Agrate has benefited from the vivisections of human bodies that Renaissance scientists had managed to carry out in the face of the Church’s disapproval and he has created a good representation of the muscles and sinews of a human body after the skin has been stripped off. He has of course maintained the tradition of having the Saint hold his flayed skin but has made more of a fashion statement of it, draping it artistically around the Saint’s shoulders. And it is now that we come to the connection with the Vibram FiveFingers shoe. This photo, taken from another angle, shows very clearly the feet of the flayed skin. I see an uncanny resemblance in these with the Vibram shoe. Hence my feeling of creepiness.